The company says it has 15 projects being tested globally. Meanwhile, some question whether today's testing requirements  which some have called "abundant" and others have called "onerous"  really ensure reliability. Solyndra has 15 beta projects up and running globally, with the latest one - in France -- installed Monday, J. Kelly Truman, vice president of marketing, sales and business development, told Greentech Media. When the thin-film solar company came out of stealth mode last week, it said it was testing panels at 10 beta sites (see Solyndra Rolls Out Tube-Shaped Thin Film and Green Light posts here and here). On average, the tests have been running six or seven months, and the company also has a few panels on its own roof that have been operating for years, said Mike Grunlow, senior director of marketing. While the company wouldn't disclose any of its end users, it plans to "make a big bang" with an announcement soon, he said. The panels, which are backed by a 25-year warranty, have been certified by the Underwriters Laboratory and the International Electrotechnical Commission, among others, he said. And the tests the company does internally at its factory go above and beyond the requirements of those standards, he added. Testing is an important issue for new solar technologies, including those - like the ones used by Solyndra - that use thin films of copper, indium, gallium and selenium instead of crystalline silicon to convert sunlight into electricity. Many companies are offering 25-year warranties on par with those offered by traditional crystalline-silicon panel makers to assure customers their panels are reliable. But because companies with new technologies haven't had products on the market for decades, they can't be 100 percent sure that unexpected problems won't end up costing them real money in recalls or warranties. That's where testing comes in. Like the machine that "sits" on chairs over and over again at Ikea, companies take their products through accelerated testing that attempts to mimic, say, 25 years of usage in a few months. In a session at the Solar Power International conference in San Diego this week, Jigar Shah, chief strategy officer at SunEdison LLC, said venture capitalists often tell him they have a company that has reached commercial production and are ready to sell him panels. "No, you're not," he said, adding that reaching commercial production is just the beginning of a whole process companies need to go through to satisfy banks that panels are reliable enough to be used in large solar projects they are financing. SunEdison designs and manages the development and construction of large solar projects and pays the upfront costs of the installations in exchange for tax credits and contracts to sell electricity to customers, then owns and operates those projects. The reliability testing requirements aren't failsafe. said Charles Gay, vice president and general manager for the solar business group at Applied Materials. "We have to start out with abundant testing, and the test protocols don't tell you what you need to know," he said. "You test for safety and some degree of reliability, but you still have failures in the field." Also, because products are constantly improved and updated, the panel that's been tested in the field for five years isn't the same as the panel being manufactured today. "It will always be a moving target," he said, adding that it's essential for companies to monitor some percentage of their systems to keep an eye out for potential failures and flaws. Nancy Hartsoch, vice president of corporate marketing for concentrating-solar company SolFocus, agrees that testing is important. She said her company has had panels up for about two years and takes customers to see them -- even though they aren't the current generation of concentrators -- because they want to show they have had panels operating "for a long time." SolFocus does accelerated testing on the components, panels and full systems beyond those required by certification standards and, based on tests and modeling so far, has been gaining confidence in its 25-year warranty, she said. "It's an ongoing process," she said. "We've spent most of the last two and a half years doing testing. One thing we're concerned about is whether everyone in the industry does that. We think it's critical for the industry, both for developers counting on certain electricity production and companies counting on certain failure rates. Companies have to go beyond certification standards." Although First Solar, which makes cadmium-telluride films, is having no trouble selling its panels - it has the lowest cost in the industry at $1.09 per watt and is selling panels for $2.50 per watt, about 40 percent below the market rate, according to a research note from Lazard Capital in August - competitor SolarWorld, which makes crystalline-silicon-based panels, thinks customers will favor traditional panels because of their longer history on the market. "If customers have a choice between crystalline or thin-film, you can ask the question: What is the more reliable [product], and can you guarantee it for its lifetime?" 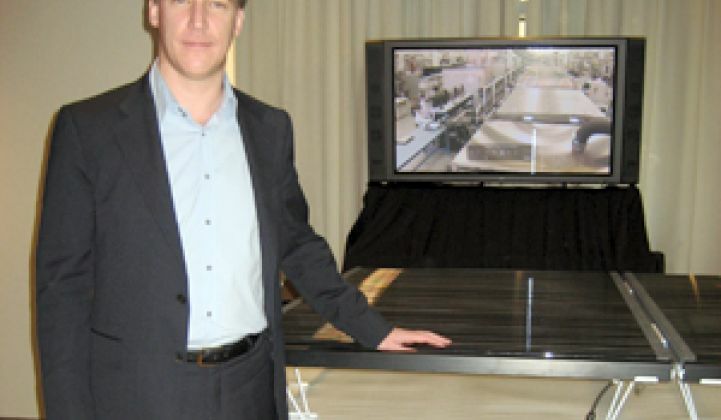 said Boris Klebensberger, chief operating officer for SolarWorld. "I can. I have products out there that are 30 years old and still working. I can prove it. How many people have thin-film panels that have been out there for 30 years and are still working?" But if companies needed to test products for 30 years before commercialization, nothing new would ever succeed, said Keshav Prasad, vice president of business development at Signet Solar, which began commercial production of thin-film panels using equipment from Applied Materials on Monday (see Solar Shares Brighten and Signet to Start Thin-Film Solar Production). "If that was a true statement, we wouldn't do anything in this world," he said. "Intel chips haven't been around 25 years." While it's technically true that thin-film panels produced at high volumes haven't been out on the market for long enough to have proven they can survive as long as crystalline-silicon panels, some have enough of a history to reassure the average customer, said Jenny Chase, a senior associate for New Energy Finance. "First Solar has shown that modules do what they're supposed to do," she said. "If none or few have degraded after four years, you can be reasonable certain that [only so many] will degrade after 20 years." She added that amorphous silicon has been around for a long time and has seen plenty of tests, reported in academic papers, that indicate they don't degrade quickly - although they have had other problems, particularly in encapsulating films in panels so they are protected. The lack of in-the-field history might mean a discount for thin-film panels as some customers favor larger and older manufacturers whose warranties they might have more confidence in, she said. Banks that finance projects tend to favor big manufacturers they trust more, she said. However, Chase added that it's not just new entrants that have quality-control problems. BP had a major recall of crystalline-silicon panels starting in 2006.